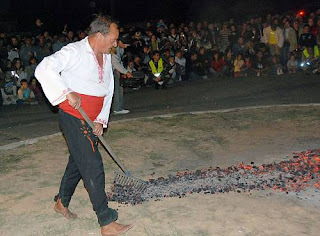 The Nestinarstvo fire-dancing rite is the climax of the annual Panagyr ritual on the feast days of Saints Constantine and Helena (3 and 4 June) in the village of Bulgari, in the Mount Strandzha region of south-east Bulgaria. The ritual is held to ensure the well-being and fertility of the village. In the morning, consecrated and ceremonial rituals are solemnized and a procession with the sacred icons representing the two Saints travels outside the village to a spring with holy water, accompanied by drum and bagpipes. At the spring, holy water and candles are handed out to everyone present for good health. The festival culminates in a fire-dance in the evening as the highest form of veneration of the Saints. People silently form a circle around the burning embers led by the sacred drum, and the Nestinari, who are spiritual and physical leaders through whom the saints express their will, begin entering the circle and treading the embers. Formerly celebrated in some thirty nearby Bulgarian and Greek villages, Nestinarstvo remains today in Bulgari, a village of only a hundred persons. During the Panagyr, however, thousands crowd the village, including in recent years many Greeks who join the ritual.